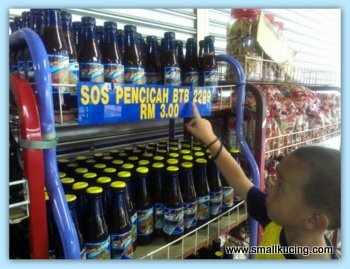 Each time "balik kampung"(go back home town) , Papa would look for one f his favourite snack. 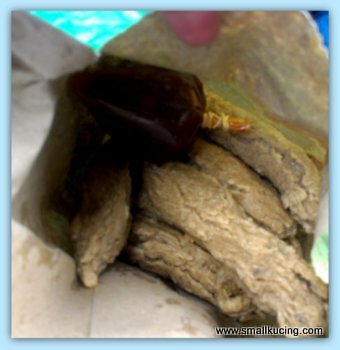 Keropok Lekor. Keropok lekor is a kind of snack famous in Trengganu which is located in East Coast of Malaysia. 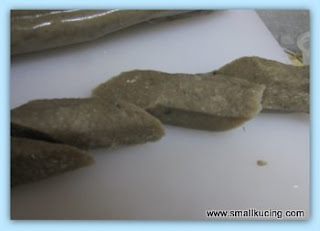 It is made of mashed fish flesh, cornstarch and salt knead into rope like. Then boil in hot water. Previously the most famous Keropok Lekor came from a place called Losong in Kuala Trengganu. But in recently, Bukit Tok Beng had become a famous destination for Keropok Lekor. The most famous shop in Bukit Tok Beng is Keropok Lekor B.T.B 2209. 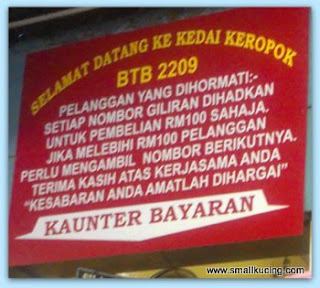 The shop has so much business that you will need to take a number just to order the Keropok Lekor. 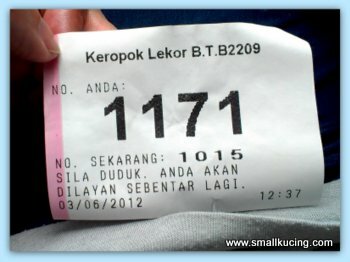 Each number taken allows the customer to buy up to RM100 of Keropok Lekor only. Any extra, you will need to take new number. It was Sunday when we went looking for the Keropok Lekor. In Trengganu, Sunday is a working day and not a weekend. However, it was school holidays. This is probably why when Papa went to take a number, Papa came back empty handed. Our number was 1171 and currently they were serving number 1015. That means there were 156 people ahead of us. Mamarazzi's friend laughed when she saw the message says "Please have a seat. You will be attended shortly". While waiting for Papa to take a number..yup...have to queue up even to take number... Mamarazzi snapped some photos. It was fully loaded with woods. Gosh! They really need a lot of wood to cook the Keropok Lekor. All these waiting certainly tiring. In the end, Papa decided not to wait. 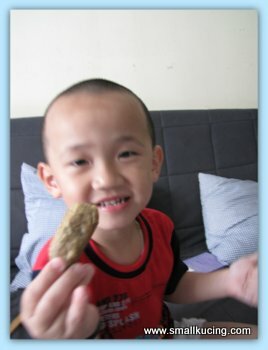 He ordered the Keropok Lekor and told the man that he will go and pick up the next day. Meantime, Papa stop by a road side stall to buy some fried keropok lekor to satisfy his craving. Hmm...not nice. Can see from the look of it that its full of flour and very little fish. The next evening, we came back to the shop to pick up our order. 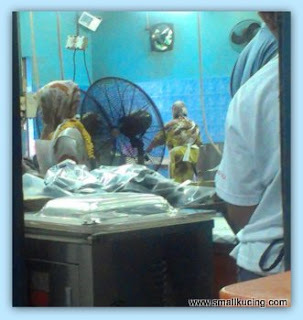 In the "kitchen", the keropok lekor were being vacuum packed. 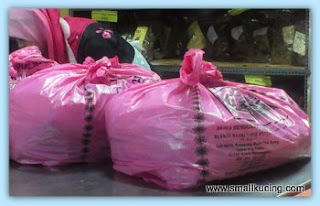 Cost extra 50sen for a pack of vacuum packed Keropok Lekor. It certainly makes it easier to store and carry. Our two plastic full of Keropok Lekor. Ah Kung thought we were crazy to buy so much. Each packs have 10 pieces of keropok lekor. Papa bought 10 packs. This is how the Vacuum packed Keropok lekor looked like. In the beginning Mamarazzi said it looked so "fake". But she certainly revised her opinion after eating it. 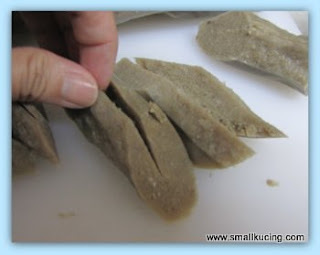 Here is how you cut the keropok lekor. Slice a bit in the middle so that when frying it would "open' more. 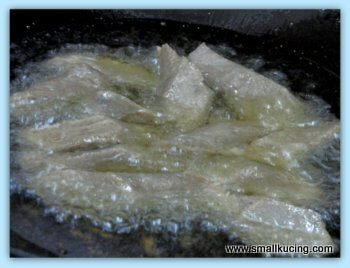 Fry the keropok lekor with a lot of oil. Must be very careful as if you happens to buy those Keropok lekor that is full of flour, it might "explode" and splash you with oil. 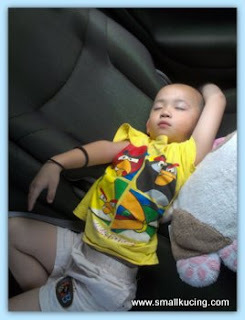 Mamarazzi kena before. Yummy..keropok lekor ready to be eaten. Don't be deceived by the ugly look. It taste very good. 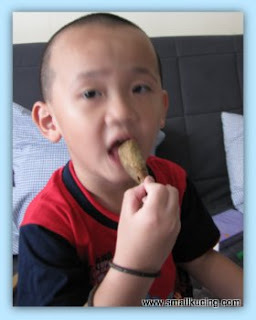 Mamarazzi said taste especially good if dipped in this sweet and spicy sauce. Here is the address (as printed on the plastic bag) of the stall should you wish to try the delicious Keropok Lekor. Keropok lekor goes high tech....lol! wow..I hvn't taken that for a long long time already.. Ya...keropok lekor, 0 marks for looks...100 for taste. Aiyor...burning all that wood! No wonder got haze!!! Wah..keropok lekor, one of my fave snacks. P/S: My mum told me I cannot eat beans. Hi There, Keropok Lekor must be very popular there --since it is hard to get. Glad your hubby finally got some though!!! Bet it is good with that special sauce. in vacuum pack somemore! Canggih! Wah, first time I hear buying keropok lekor need to queue and take number. So high tech. Must be very sedap! You have really messed up my mind!! 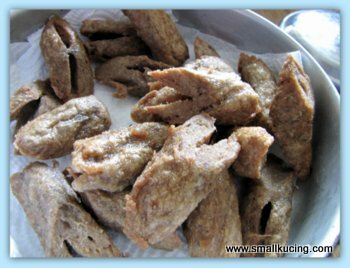 !I love keropok lekor and I wouldn't mind waiting for it if the taste is really superb.Out of curiousity, how long kena tunggu tu?I've tried making once but not as nice...I think I've put too much fish.I've been looking for keropok lekor in Oz and here but tak jumpa-jumpa! !Meleleh air liur tengok yours. Keropok Lekor? 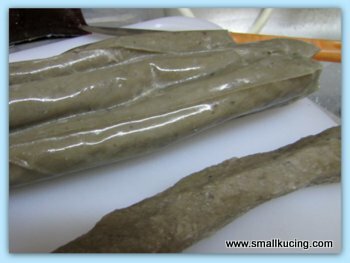 ground fish with flour? is it the same with kikiam? After reading this post, I must go to pasar malam to buy keropok lekor this evening. So tempting. But it certainly looks good. 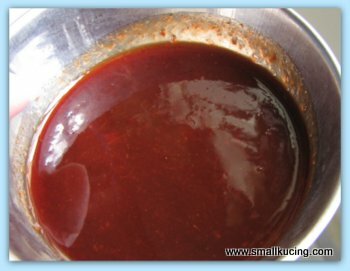 dip with chili sauce, yum! :D woah so kua cheong one! must try if i have the chance to kuala trg.. I'm a fan of keropok but have never seen such type before. Looks thick & hard. I've never seen that, and you're right, it does look ugly. What does it taste like...salty? 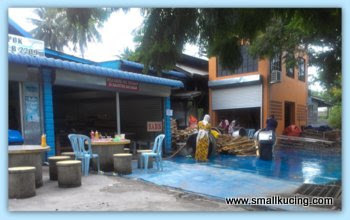 Wah this keropok lekor shop is quite cocky hor...business is so good until they limit the amount that you can buy! Hundred over people, I won't wait too. Luckily paparazzi is smart enough to collect the next day :) It looks so yummy!! it can be addictive, just like potato chips. even if you can finish eating the 10 pkts, i'm sure friends will appreciate them as gifts! wah, really scary lah!! buy lekor also need to take numbers..
and somemore so long queue, more than 100 customers before you..
wah, their lekor must be very very d*mn nice else people also don't bother to queue..
anyway, i only like the thin crispy lekor, don't like those default thick ones..
ya ka? Got that ka? ya la....never seen before leh..
KL not many places that do good keropok lekor hor.